Isn't someone going to feed us? We're hungry! A puppy's first food should be colostrum, the rich initial milk that provides antibodies to protect him from the get-go. However, if a newborn puppy is orphaned, or his mother can't provide milk, it's up to you. In an emergency, you can put replacement milk together from supermarket items. The best thing for a newborn puppy is mother's milk. If he can't get it from his own mother, call your vet to see if she has canine colostrum on hand or if she knows of a nursing dog who might be able to accept your puppy. If that doesn't work out, your best bet is commercial puppy milk replacer, available at pet stores or at your vet's office. Puppy milk replacer contains all the nutrients a puppy needs. Of course, it's quite likely that you discover that your pup is orphaned or needs food in the middle of the night. As an emergency measure, you can put together a temporary, homemade puppy milk replacer. Parkway Animal Hospital in Cary, North Carolina posts this homemade puppy milk replacer formula on its website, but emphasizes that it should be used only until you can purchase commercial milk replacer. It consists of 1 cup of whole milk, 2 egg yolks, 1 tablespoon salad oil, and 1 drop of a liquid multivitamin if you have it. Mix the ingredients together in a blender. Whether using a commercial or homemade milk replacer, make only enough for a day's feeding, throwing out any leftover formula. The University of Minnesota offers some similar recipes for emergency puppy milk replacer, based on what you might have on hand. In a pinch you can mix together 3 parts evaporated milk—not skim—to 1 part water. The second recipe is identical to Parkway Animal Hospital's, minus the eggs. A third recommendation consists of 1/2 cup whole milk, 1/2 cup water, 1 to 2 egg yolks, 2 Tums as a calcium supplement and a teaspoon of vegetable oil. A fourth recipe consists of 1 cup whole milk, 1 tablespoon vegetable oil, 1 pinch of salt, 3 egg yolks and 1 drop of liquid infant vitamins. 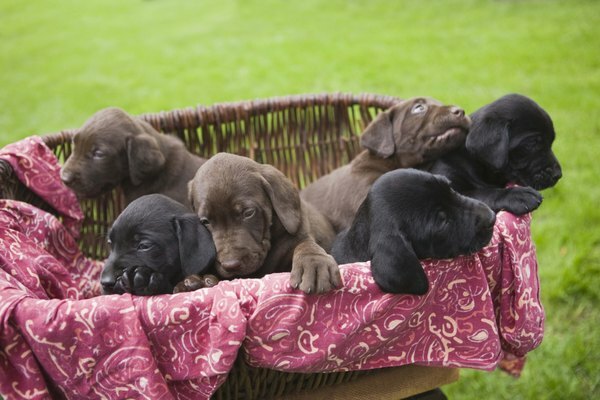 Call your vet to find which of these recipes best suits your puppies, based on age and size. Once you've mixed up your emergency concoction, you must safely feed the puppy. At 2 weeks old and under, puppies should eat every three to four hours. According to the American Kennel Club, the formula should be fed at body temperature. The best way to do this is by placing the formula container in a pan of warm water. Drop a bit on your hand or wrist to make sure it's not too hot. If you don't have a nursing bottle to feed the puppy, use an eyedropper. Hold the puppy gently, keeping him warm. Keep his head up while he lies on his stomach, just as he would when nursing from his mother. If milk comes out his nose, he's sucking too fast. After feeding, hold him upright with his head on your shoulder, gently rubbing his back until he burps.